LHC News - They need to replace 9K cables. While my techs complain all the time of the extra labing I do for our fiber and ethernet network. Imagine how they'd complain if I made them go back and replace it without the labeling. Why does Time move forward? Could it be K and B Mesons behavior differently depending upon time's direction. Lots of more work to do but an interesting idea. Planet 9 found or not looks to be coming around 2022 with some new measures and, of course, new telescopes. I thought some would like this image. What we can see is that idea that our solar system is flat, is incorrect. The blues are the planet orbit. The purple are some other larger objects, like Sedna. The yellow is the predicted path of Planet 9. For your Nibiruians here is an image of a Chilean astronomer, Carlos Ferrada, that believes Nibiru exists. 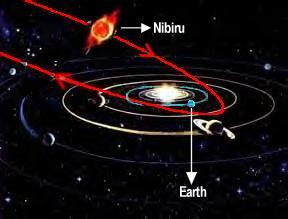 As we can see here the angle of the projected Nibiru does not match that of Planet 9. There are other supposed image paths of Nibiru/. (I felt an astronomer might have a bit better guess than the layman.) Also, because most of the layman diagrams represent the solar system as a flat concentric circle orbital path of the planets with Nibiru being an ellipse in the same plane. We know, of course that the planets aren't in the same plane and don't have a circular orbits. This begs the question is this the best Nibiru path? An important part of the Nibiru postulate is actually coming up with a predictive path so someone could try observing it. More missing mass found in our galaxy. Also, there are rumblings that LIGO has detected gravity waves. Feb 11th is supposed to be some LIGO published papers so we might have a clue soon. On the topic of LIGO. LIGO was put in place about a decade ago. It didn't detect gravity waves. However, it was viewing at the largest size predicted. A couple of years ago 2 detectors were shutdown and improved They started measuring last Sept and ended this Jan.
Next steps - improvements continue and what's around a 4fold increase will be larger as more increases are made into 2021. Also, a 3rd detector is coming online. This will help triangulate the origin of the gravitational signal. Then we should be able to look to see what generated the gravity wave. The fun thing of experiments is finding that unknown or sometimes even more exciting is not finding it. The later often means we have more work to do. You were looking for experimental confirmation of gravity waves - "done"
Of course in science nothing is "done" as the review, re-experiment, and testing is endless. But, there's now evidence that gravity waves do indeed exist. More experiments will continue as LIGO upgrades in sensitivity and a 3rd station will conduct more over the next 5+ so years. Response filled with conspiracy theories and thinly veiled insults incoming in 3..2..1.. Awesome news, btw. It WAS starting to look a little bleak there a moment, and I really didn't appreciate how Lawrence Krauss leaked the rumour. I honestly thought better of him. Well, obviously it would be more awesome if Lou was right, that's sort of the whole point here. But at least it means we're on the right track to understand how things are working, which surely is a good thing, even though it might mean things like anti-gravity etc won't happen. I honestly look forward to the sort of future envisioned by Kim Stanley Robinson even if Peter F Hamiltons ideas are way cooler. So could we get back to working on whatever comes after carbon nanotubes, I want my space elevator, damnit. I expect some sort of variety of conspiracy theory will arrive soon, as well. Can we award points for creativity over truth? I forgive Krauss. The theories tested here were over 100 years old. The scientists were trying to crack this one for about 50 years. He was probably more excited than an 8 year old on Christmas morning. The exciting stuff is it opens a whole new way to explore the universe. Very cool! Lou likes Superconductivity, even if we haven't found the magical properties he described, there was some superconductivity news this month too. The higher temp superconductors snap the electrons into alignment - nematicity. Understanding that this is what is happening may allow us better tune the crystal structure. Some think it might be the key to cracking room temperature superconductivity. We'll see. So much like everything else, they measured a fluctuation in EM and called it something else, like what they do with everything else. Remember, relativity is just a special case of EMRP, hence everything that GR or SR predicts can be predicted with EMRP. However, the reverse is not true without adding voodoo and black magic. So the guy blams RP and ??? As I stated above 1 experiment does not end science. While LIGO has demonstrated the last of the big Einstein ideas does work, we do need more experiments and in differing ways to get better evidence. Now back to the experiment. For argument sake let's give this the benefit of doubt and say it really worked how he/you believe. A next step could be modulating the causing force. So, if the postulate of this being RP is true, one way to further demonstration this is to modulate the RP. Lots of ways to do that - expose to sunlight and block the sunlight, do it in a black box, use materials of different RP reflectivity, etc. By changing the strength and direction of RP in the system it should (assuming it's RP) change the results of the experiment. This isn't as muddling as you thought it was. It's just not compelling. Last edited by BrianK on 12-Feb-2016 at 07:38 PM. Did you see the large amount of mass found? Radio telescopes were used to see through the Milky Way. It appears things are moving towards a central point - The Great Attractor. It has the mass equivalent of a million-billion suns. Would you care to cite some evidence to corroborate your assertion? But of course, evidence is a scientific concept that only applies to other people. You are like some biblical creationist that keeps referring to stories in Genesis when asked to give evidence to support the stories in Genesis. EMRP as you call it predicts that two white dwarf stars in space will move apart at speed due to the intense radiation pressure in the tiny gap between them. And yet the two white dwarf stars in the system called SDSS J065133.338+284423.37 (J0651 for short) are slowly moving towards each other despite the fact that they are only a third the distance from each other that the Earth is to the moon. You posted that same document a couple of years ago, and my response to "engineer Borg" (his description of himself, not mine) hasn't changed in the intervening time. His assertions were unwarranted and his maths was piss-poor then, and his assertions are still unwarranted, and his mathematics is still unjustified. Even if his equations did work, (They don't) it doesn't mean his assertions are true, they have to be matched by real world observations. I am not denying the existence of radiation pressure, I have a Crookes radiometer on my window shelf at the moment, and because it is an overcast day it is not turning. I know radiation pressure exists, but unlike you I also know its magnitude. Last edited by Nimrod on 13-Feb-2016 at 03:22 PM. You are forgetting that everything predicted by GR and SR is predicted by EMRP. There GR and SR have to throw in voodoo and black magic is to explain dark energy and dark matter. And by dark matter, I mean the 'exotic' kind, not 'stuff they haven't seen yet' such as the case discovered with the galaxies behind the milky way. So, once again - how does 'gravity waves' which by the way means the ether exists, now called the vacuum, also renamed as the higgs field, which means that there is energy in the vacuum like QCD says there is because these pressure waves need a medium.... Anyway - how do 'gravity waves' disprove EMRP? Why is our sun so light? Another prediction of the EMRP theory is the macroscopic mass defect, which results as a direct consequence of shadowing of the incoming ultra cosmic radiation. As waves penetrate through a large spherical mass, such as a planet, they get slowly attenuated in a radial direction towards its core. Since weight depends on the interaction between mass and radiation, the deeper spherical shells of such a mass will be perceived as having a lower density. This can leave the central core of matter virtually inexistent for external electromagnetic fields, and thus almost completely isolated from any inertial or gravitational effects. In other words, the massive spherical centre will behave more like an empty sphere to the exterior, and most matter within it no longer communicates its weight to external force fields. This has great implications in the way we think planets, stars and our own sun are composed. We would of course expect to find evidence of this macroscopic mass defect in the biggest bodies of our solar system, in which the sun gets its first place. This theory in fact supports the main issue that Professor Oliver K.Manuel, now long time member of Blaze Labs Yahoo team, has been pushing forward for the past years about the origin of the solar system with Iron-rich Sun. The main problem with Oliver's issue was that although he has all the physical evidence that a lot of iron is present in our sun, the gravitational force of the sun shows that its total mass is that of a ball of the same radius as the sun but with a density slightly greater than water! Would you believe that? The present accepted density for our sun is just 1.41g/cm3, yet we know it contains a vast quantity of metals which one cannot account for in its mass. Newsflash: read up on the detectors - they are magnets surrounded by a lot of metal to filter out most frequencies. That's frequencies of EM, not frequencies of black magic. All your voodoo theories do is throw a paradigm on EM to make things simpler to the point a nimrod can understand it. An even funnier newsflash is that these detectors are just more sensitive versions of the Michelson–Morley experiment which was supposed to prove that the ether doesn't exist...but 'gravity waves' prove otherwise. In other words, you provide no actual contrary experimental evidence and just dismiss it like the people who dismissed Columbus. Last edited by Lou on 17-Feb-2016 at 04:51 PM. LIGO uses a simple photodiode as detector, where blocking off incident light is fairly trivial. You are forgetting that everything predicted by GR and SR is predicted by EMRP. Really? Then have the experimenter do what I suggested and he'll see the effects are indeed different. HUH? By measuring atoms 0.30% are iron. There' twice as much oxygen and there's 300times as much Hydrogen. Yeah he might want to go check his vastness. There's probably more iron in the working Fieros than on the sun. I hope there aren't roughly 10^15 Fieros per human on earth. P.S. on a sunny day, the vanes on my Crookes radiometer spin, but the curtains do not flutter That would be because there is insufficient pressure even in full direct sunshine to overcome the gravitational attraction between the mass of the curtains and the mass of the core of the Earth. @BrianK I think your figure for Iron in the sun is a bit off. And what about the iron (rust) in the non-working Fieros? ..Thanks - yes 0.003% of atoms or roughly 0.14% of the mass. And yes that's more than the Fiero. That was a bit of hyperbola. Compared to the body itself the % of iron on the earth (~8%) is larger than the sun (.14%).